This week the storms have made a noticeable and devastating impact on our seafront’s iconic West Pier. After winds of 70mph a chunk of the burned out frame has collapsed and main supports on the east side have been washed away by rough seas. Now with storms looking to remain persistent throughout the week, will this beloved memory be washed away all together? The West Pier was first opened in 1866, built by Eugenius Birch. Ironically this Pier was originally built to specifically survive the adverse environment of the seashore, yet once abandoned, it has deteriorated ever since. In the early 1990’s the West Pier was cut off from the shore (partly deliberately, for safety reasons). Battling through storms, the Pier was still offering regular tours until 20th January 2003. A further collapse saw the destruction of the concert hall in the middle of the pier. On 28th March 2003 the pavilion at the end of the pier caught fire, with fire crew unable to save the building from destruction severe damage was caused. The cause of the fire remains unknown, since fire investigators were unable to get access to the site for safety reasons. Many stories hint towards arsonists or perhaps the owners of the Pier being unable to fund it anymore. On 11 May 2003, another fire broke out, consuming most of what was left of the concert hall. When the fire re-ignited on 12th May the West Pier Trust referred to the fires, yet again, as the work of “professional arsonists”. Although various plans put forward to renovate the pier, none have gone ahead. Some local residents opposed those of the West Pier Trust saying it looked like a sculptural monument. 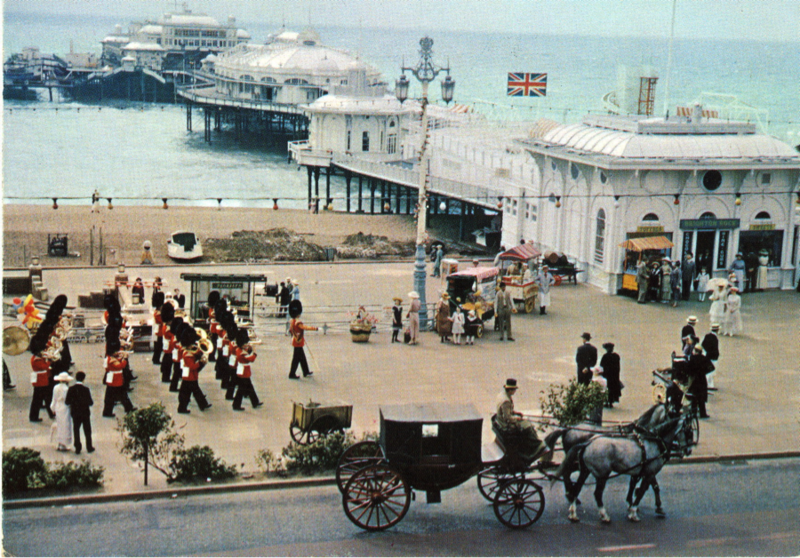 Although supported by the Heritage Lottery Fund, local media reported that a major concern was the impact of commercial operations on the shore, The Noble Organization, owner of the Palace Pier, joined the objectors, despite having originally been supporters of the restoration scheme (the 1996 Year of the Pier began from the Palace Pier). Their reported point of view was that subsidized rebuilding, were it to happen, would represent unfair competition. The West Pier Trust said on 15 July 2008 that it was confident the West Pier would be rebuilt; yet as the Pier has suffered another storm-related blow the renovation looks less and less promising. London and South East England are on amber warning, advised to be ready for high winds for the duration of this week. Last year tens of thousands of sheep and cattle were killed by icy weather during the coldest March for 50 years. Farmers were given £250,000 towards the cost of removing dead animals killed by the 2013 storm. Sussex hasn’t had any snow so far but the wind and rain are definitely proving damaging. Farmland and crops have flooded and now we are seeing landmarks literally being washed away. Now attention is on the government and how they are going to compensate the lack of action taken to help seriously flooded areas. As a proud Brightonian, it is of course sad to see the ever-dilapidating West Pier, plunge to its fate at the bottom of the ocean, or maybe to a scrap metal yard, considering the current political seat of Brighton Pavillion constituency. This would never happen though because the Grade 1 listed building is not owned by the council, but by The West Pier Trust. Due to a severe lack of funding, limited proposals have been put forward. One popular idea was the i360. But at a time of economic downturn, and the proposed figure in the 10s of millions, it is an idea many people are against. Many people think the structure is an eye-sore and that it should be demolished. This is the view held by journalist Simon Jenkins, who blames Brighton & Hove Council for “letting it rot in the sea”. The question is what are the options. A poll posted online by The Argus asked readers ‘What they would like to see happen to the pier’. The options were ‘leave it to the elements’, ‘demolish it’ or ‘rebuild it’, with 40% of people voting for the elements. This may come as a surprise (or maybe not, being such a laissez-faire city) but in my opinion, residents and even tourists like the structure as it is, the rugged metal birdcage, and dramatic scene setter. Unlike other seaside resorts like Margate or Blackpool, where everything is built for purpose and of it doesn’t serve a purpose, the attitude is to get rid of it. Well to people like Mr Jenkins (who it may be worth pointing out is from Birmingham) I would say hands off! Lets face it there is nothing you can do to save it. We should enjoy this remarkable piece of history while it lasts.